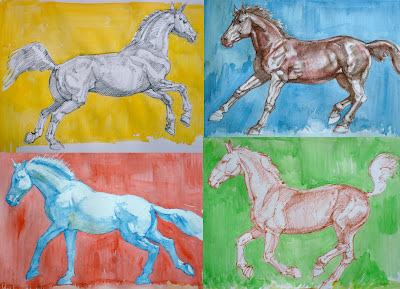 The reason I keep posting these studies in what's essentially a human figure study blog is because, I'm fascinated by how much of an overlap studying horses is (in terms of interpreting structure, shape and form) with that of the human figure. I've hugely benefited from my studies on the latter. I used to draw horses as a kid, but after learning to draw humans a little bit in recent years, I can sense my horse drawings gaining an edge. All on A3 size paper, combined. Please click to view at FULL size. Ref image by Breathless-dk in DA.